Growing up on a farm, my family lived on cold meat sandwiches during harvest. Both lunch and supper would be served to the men out in the field. 90% of the meals to the field and the ones we ate at home for September and October consisted of a sandwich, an apple or pear and three cookies. As kids, if we rode on the combine with dad, mom would send us a little version of dad’s supper. We thought it was the coolest thing to eat lunch out in the field with dad. Because we ate sandwiches for so many meals, we learned to get a bit creative. Mom was great at looking for inspiration for new twists on ham sandwiches. I remember one added cream cheese and sprouts, another had chili sauce, olives and cheese. These harvest ham sandwiches are a twist on one of our favorites. 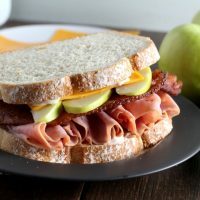 We called them ABC sandwiches, in addition to the ham, we added apples, bacon and cheddar cheese, hence the name “ABC Sandwiches”. 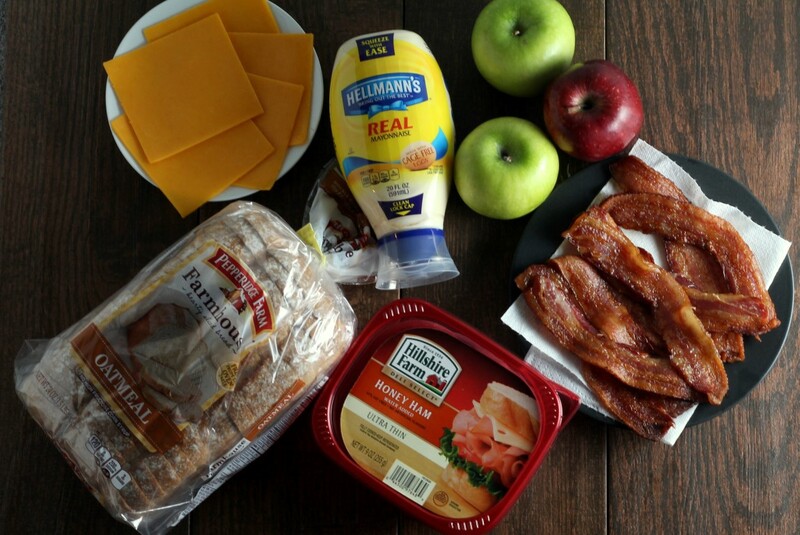 The version I’m sharing today features Pepperidge Farm Farmhouse™ Oatmeal bread, Hillshire Farm® Thin Sliced Honey Ham, Hellmann’s® Real Mayonnaise, thick-cut bacon, juicy apples and sharp cheddar cheese. Just like the sandwiches we took to the field in harvest, these sandwiches are simple, only 6 ingredients, and come together in a few minutes, especially if you have the bacon already cooked. They other nice thing is that the ingredients are super easy to pick up. 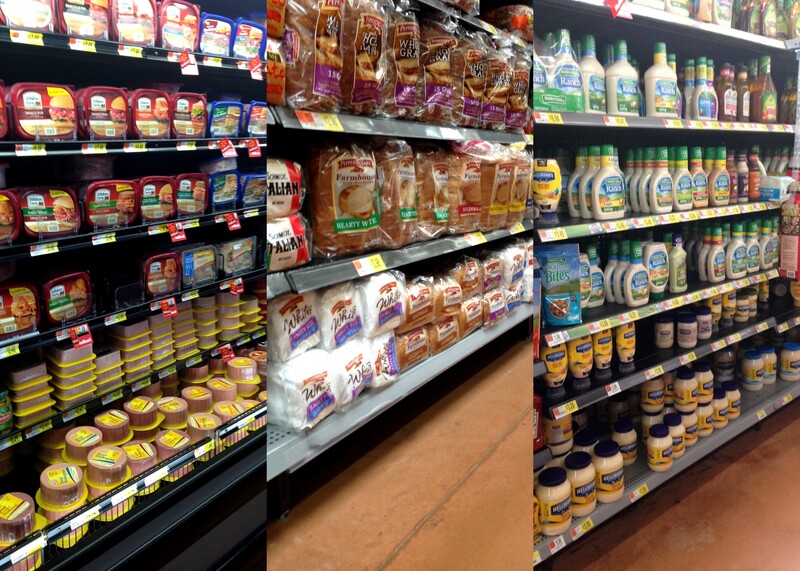 Everything can be found at your local Walmart during a quick grocery shopping trip. Be sure to also pick up some apples, cheddar cheese, and bacon. Once you have all the ingredients, start with a slice of Farmhouse Oatmeal bread. Often we would make our own bread for the sandwiches to the field. I don’t usually have time make bread these days, but a good fresh, hearty, traditional loaf of bread like Farmhouse Oatmeal, really makes the sandwich. Next, add a generous layer of Hellmann’s® Real Mayonnaise. It’s classic flavor is essential and will keep the sandwich nice and moist. Dry sandwiches that stick to the roof of your mouth are no fun. I love the squeeze bottle, so much cleaner to use than a jar with a greasy knife stuck into it. 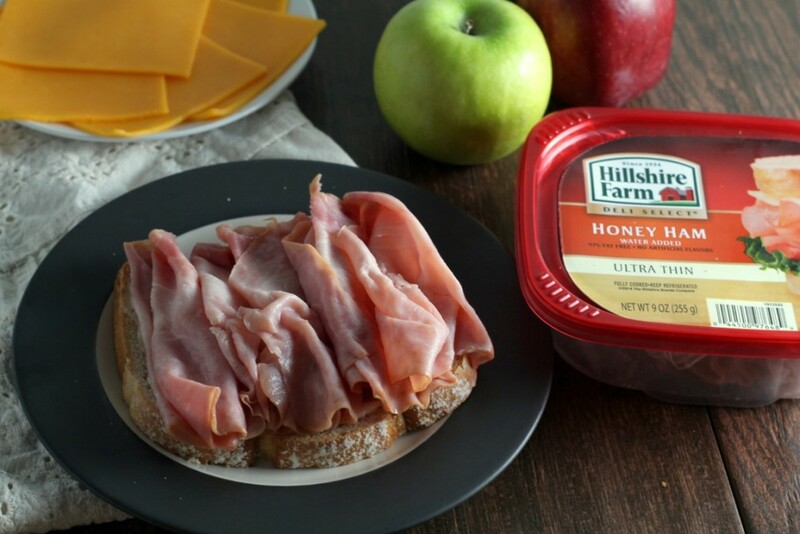 After that, add a thick layer of slow roasted Hillshire Farm® Thin Sliced Honey Ham. You can’t beat that honey ham flavor, and the texture of the extra thin slices are a perfect contrast to the thick-cut bacon. 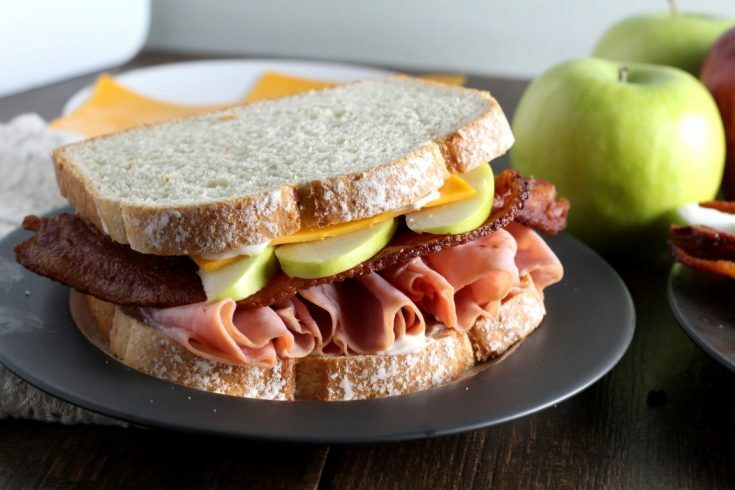 Next, add a few slices of crispy, thick-cut bacon, a few juicy apples, and a big slice of cheddar cheese. 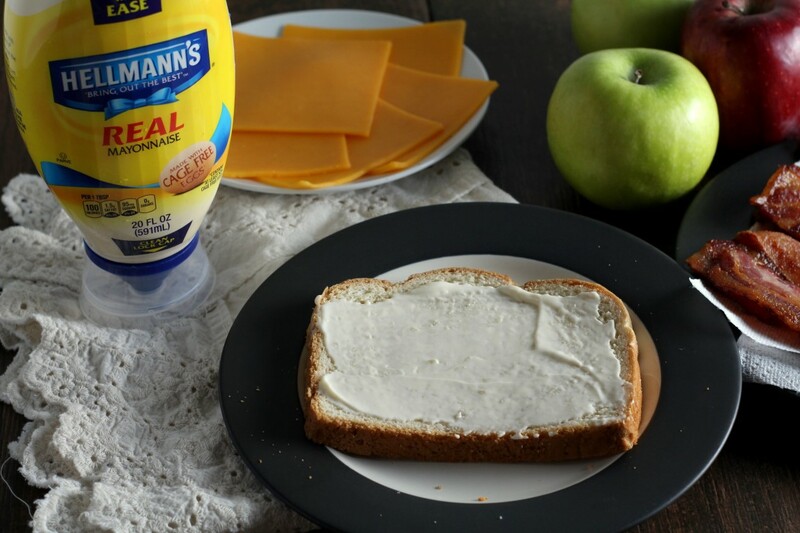 Finally, add one last slice of Farmhouse Oatmeal bread spread with Hellmann’s® Real Mayonnaise and enjoy! For more delicious sandwich ideas, check out the Sandwich with the Best Site. 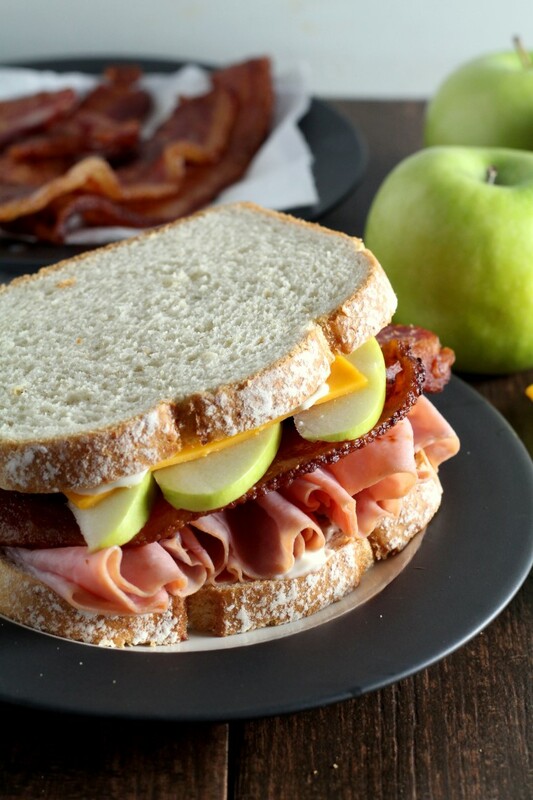 Apples, Cheddar and Bacon take an ordinary ham sandwich up a notch. Assemble the sandwich by spreading all 4 slices of Pepperidge Farm Farmhouse™ Oatmeal bread with Hellmann's® Real Mayonnaise. Then layer on Hillshire Farm® Thin Sliced Honey Ham, apple slices, thick cut bacon and a slice of cheddar cheese. Top with the remaining two slices of bread. Enjoy immediately.